Roetgen is a municipality in the district of Aachen, in North Rhine-Westphalia, Germany. Roetgen is located approximately 15 km (9 mi) south-east of Aachen, near the border with Belgium. It is in the north of the High Fens-Eifel Nature Park on the Weser stream which rises a few kilometres to the south. Between Roetgen and Rott is the Dreilägerbach Reservoir, which is fed by the Dreilägerbach stream and the artificially Schleebachgraben and Hasselbachgraben ditches. The attached waterworks supplies large parts of Aachen and the Dutch town of Kerkrade with drinking water. The parish of Roetgen includes the villages of Roetgen, Rott and Mulartshütte, which is the oldest part of Roetgen. 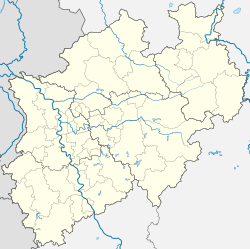 To the northwest is the borough of Aachen with its quarters of Kornelimünster and Walheim, to the northeast is the town of Stolberg with its quarters of Venwegen and Zweifall, to the southeast is the Simmerath parish of Lammersdorf. To the west, on the far side of the German-Belgian border lies the town of Eupen and the municipalities of Raeren, whose parish of Petergensfeld borders immediately on Roetgen north of Charliers Mill. Roetgen is attractive for commuters due to its close proximity to Aachen. In World War II Roetgen was the first German town to fall under American control. American forces arrived in the town on 12 September 1944 at 14.30. The city was the location of the court martial of US Army Private Eddie Slovik in November 1944, notable because of all US military personnel in World War II, only Slovik was ever executed for desertion. Mulartshütte is the oldest settlement of the three. St. Mary's Chapel (Marienkapelle, 1636–1660) is the surviving part of the first Roman Catholic parish church in Roetgen. It was partially demolished when the Neogothic St. Hubert's Church (1854–1856) was built. It was consecrated to Saint Hubertus of Liege, the Virgin Mary and John the Baptist. In Roetgen's town hall is the sculpture of a weaver by Hermann Pier (1925–1985); outside on the forecourt is a replica. It has historical and well as artistic value, because this craft was an important part of Roetgen's economic history. Charliers Mill (substructure of rubble stone, 1768) is an old water mill (today a domestic residence) on the Weser stream. In the countryside behind the mill, with its pastures, rows of beech rows and ponds runs Stage 1 of the Eifelsteig hiking trail. ^ New York Times, 14 Sep 1944. This Aachen district location article is a stub. You can help Wikipedia by expanding it. This page was last edited on 9 June 2018, at 17:38 (UTC).